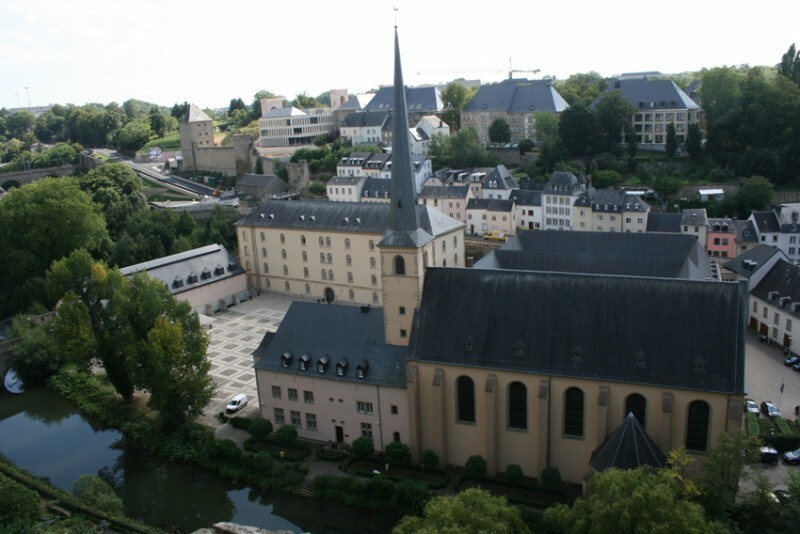 Luxembourg, the capital of the Grand Duchy holding the same name, is the smallest capital city in the European Union. With a population of 100 000 inhabitants, it is also one of the smallest capital in the world. 67 % of the population are foreigners, mostly coming from European countries. With this highly cosmopolitan atmosphere and three official languages (Luxembourgish, French and German), Luxembourg appears as a truly international capital with a unique linguistic context, a place looking a little bit like a concentrate of Europe. Often presented as one of the richest nation in the world, The Grand Duchy of Luxembourg has been designated by the World Bank as the country with the highest GDP (Gross Domestic Product) per capita. Besides, Luxembourg is sometimes quoted as the city with the highest purchasing power in Europe and it has been ranked in 2012 as the safest city in the world with the lowest crime rate. With the presence of the European Court of Justice, the European Investment Bank, the European Court of Auditors and Eurostat, Luxembourg is doubling its population every day receiving up to 100 000 commuters from neighbouring countries who come in to work. Considering the 150 international banks settled in the capital, one could think that the reputation of the city and the whole country only relies on its business sector. But it is clear that this economic prosperity has served an interesting and quite unique cultural development when you take into account the size of this capital and the diversity of its population. Some aspects of local cultural policies have indeed integrated an international approach, casting bridges with neighbouring countries and offering a concrete vision of what European cultural projects can be. Due to its small size and its international population, there is a need for the cultural structures based in Luxembourg to think their action on a European level, with a international mentality and programs developed for audiences speaking different languages and with different cultures and backgrounds. All cultural venues in town, whether they deal with visual or performing arts, have their communication supports and programs at least available in three languages (French, German, English) and sometimes more with texts written in Luxembourgish, Dutch or Portuguese (an important community from Portugal is living there). The plurio.net web portal is available in three languages (French / English / German) and allows each participating region to disseminate cultural content to foreign audiences. It presents the culture and art (exhibitions, shows, concerts, venues…) in the Great Region adopting a broad vision. Co-funded by the Great Duchy of Luxembourg along with neighbouring regions, the project is handled by a liaison office based in Luxembourg city. This tool has been made for a public who turned as a way of life the crossing of borders for work but also for leisure or entertainment reasons. Another example of an artistic project that blurred the borders is the Mono Art Biennale, held in 2012. It gathered fifteen institutions scattered through Luxembourg, the French Region of Lorraine and the German Lander of Saarland around one project: presenting during one summer twenty monographic exhibitions of modern and contemporary artists. The Espace Culturel Grande Région, initiated by the Grand Duchy in 2007, using the dynamic generated by the designation of Luxembourg as European Capital of culture that year, is organizing and supporting trans boundaries projects in order to make visible the vitality of the art scene of the region, whether it comes from Belgium, France, Germany or Luxembourg. The structure is for example providing grants to projects creating a link between cultural practitioners working in these countries. It also delivers every two years the Robert Schuman Art Price, doted with 10 000 euros. The organisation of the prize and jury is made jointly by Luxembourg city with the cities of Metz (France), Trier and Saarbrucken (Germany). Also worth considering to illustrate these efforts to put forward emerging talents in the contemporary art field and pay attention to young creators with a wider scope than national limits is the Edward Steichen Award Luxembourg. This prize bears the name of the former curator for Photography at the Moma in New York in the 50’s. Steichen, who was born in Luxembourg, made most of his career in the United States and became one the most famous photographers of all time. The prize is awarded every two years to a young artist aged between 25 and 35 years, living and working anywhere in the Great Region. The recipient is also invited for a six-month stay in the International Studio and Curatorial Program (ISCP) in New York. The organization of this award is made by a not for profit structure based in Luxembourg and mostly funded by the Ministry of Culture and the Ministry of Foreign Affairs of the Grand Duchy. As we can see, strong support has been provided to culture via public funds coming from the State and the City council, consecutive to the emergence of Luxembourg as an international hub for finance since the 80's. But private funding is also noticeable, as the Private Art Kirchberg initiative can demonstrate. Held every year during one day in September, the private collections of the banks established in Luxemburg city are open to the public for a contemporary art promenade through the Kirchberg district (this area is the home of almost all the representations of international banks in Luxembourg). A curator is invited every year to pick its favourite works in each collection and to propose a stroll where hidden treasures of contemporary art can be enjoyed. Moreover, Luxembourg has made a lot of efforts to "exist" along bigger and more visible cultural cities in the vicinity such as Brussels, Köln or Strasbourg. Parts of this strategy rely on developing world-class cultural venues with the help of famous architects. The MUDAM - Musée d’art moderne Grand-Duc Jean, for instance, has become a renowned home for international contemporary art. The museum, inaugurated in 2006, has been created by Sino-American architect Ieoh Ming Pei and built on the vestiges of Fort Thüngen, a 18th century fortress. Just next to this museum, the Philharmonie designed by French architect Christian de Portzamparc and home of the Orchestre Philharmonique du Luxembourg, has become in less than ten years one of the most renowned philharmonic hall in Europe. Another highlight of the local cultural scene is the Casino Luxembourg - Forum d’art contemporain. Located right in the heart of the city and hosted in a former casino built at the end of 19th century, this art centre was opened in 1996 and proposes since then an international exhibition program and artistic residencies with a special focus on young creators. Today, the Casino stands as one of the best place in the Great Region to get in touch with the latest trends of the contemporary art scene. These dynamic examples in the visual arts also have their counterparts in the performing arts. The 3CL (Centre de Création Chorégraphique Luxembourgeois) is a centre committed to support contemporary dance via the production and promotion of choreographic projects with a special attention given to experimental works. Through his different programs, the 3CL has set close ties with international partners, located within the Grande Région and beyond. It has for example invited artists from Austria, France, Italy, India, Japan and Hong-Kong for residencies. The 3 CL also organises the Danz Festival Lëtzebuerg, the most important event related to contemporary dance in the country, which will celebrate its tenth edition in 2014. Located not far from the 3CL, close to Luxembourg Central Station in the southern part of the city, CarréRotondes is a multidisciplinary art centre presenting dance, live music and contemporary visual art exhibitions. The place welcomes artists, groups and companies from all over Europe for live performances of contemporary dance, circus and independent electronic and rock music. The structure will soon mark a new step in its history, leaving its actual compound set in a former fabric to relocate in 2014 in two roundabouts (“Rotondes”) formerly used as locomotive sheds and situated just next to the impressive train station. All these remarkable cultural venues have certainly contributed through their activities, bearing a strong international flavour, to turn Luxembourg art scene into a brighter spot on the European map. It is clear that Luxembourg has succeeded to attenuate different kinds of boundaries (geographical, national, linguistic) to become an attractive territory within the European Union on the economic level and for work reasons. But it would be much unfair to limit this attraction to the sole business sector. This capital has also become a cultural platform with a strong identity and a mind of its own, a model that draw attention from far beyond the Grand Duchy limits, setting as priorities to bring together regional partners and strengthening the cooperation of cultural operators. With its small dimensions, The Grand Duchy of Luxembourg clearly felt that carrying out cultural projects with partners settled on the other side of its frontiers was an absolute necessity more than an option. Despite this peculiar European context, Luxembourg cultural scene, with its trans borders and multilingual projects, can certainly be considered as a valuable example for other regions in the world. Florent Petit is a former project officer in the cultural unit of the French Embassy in Japan. He holds a Master’s degree in Art History from the Sorbonne University in Paris and in International Relations from the Institute of Political Studies of Lyon. Former lecturer of Chinese, Korean and Japanese art in the Ecole du Louvre in Paris, he has occupied several curatorial positions in museums in France (Asian Unit of the Musée du quai Branly, Paris) and Luxembourg (Mudam, Museum of contemporary art, Luxembourg City).